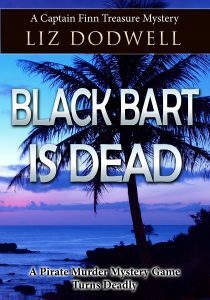 A pirate themed murder mystery party on Mud Bug Island turns deadly when one of the guests is found gutted for real. Trapped on the island by a raging storm, shipwreck treasure hunter, Captain Finn must find the killer. When Finn and his sidekick, Phill, are persuaded to participate in a fund-raising murder mystery event, who knew they’d end up with a real corpse on their hands? To make matters worse, the group finds themselves stranded by a fierce tropical storm, with no way to communicate with the police. Tensions are high and tempers flare as Finn discovers almost everyone had a reason to commit the murder. He and Phill strive to discover whodunit before there’s another terrible tragedy.